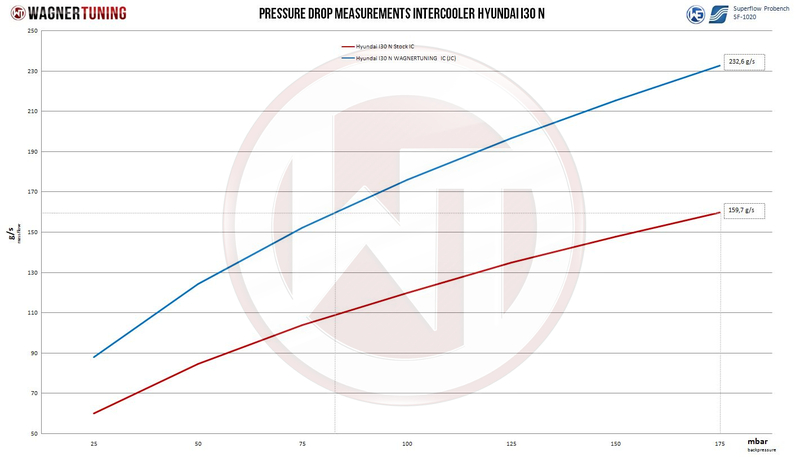 The WAGNERTUNING high-performance intercooler has got a new performance core (bar & plate) with the dimensions 580 mm x 150 mm x 135,4 mm 580 mm x 62 mm x 70 mm (stepped core: 14,3 liters) / 22,83Inch x 5,91Inch x 5,33Inch 22,83Inch x 2,44Inch x 2,76Inch (stepped core: 872,64Inch³) , which was developed especially for the requirements of the Hyundai I30N. This high-performance core offers an 44,3 % larger frontal surface and 101,4 % more core volume compared to the stock intercooler. The aluminum cast endtanks were designed in CAD and optimized in CFD simulations (for an ideal internal airflow). The result is a excellent cooling property with a minimal back pressure. The newly developed performance core provides the adjoining components (for example the watercooler) enough air flow by using a specially prepared air baffle. That`s why this kit is perfect for racing use. An optimal cooling effect of the charged air with a significant increase in performance! 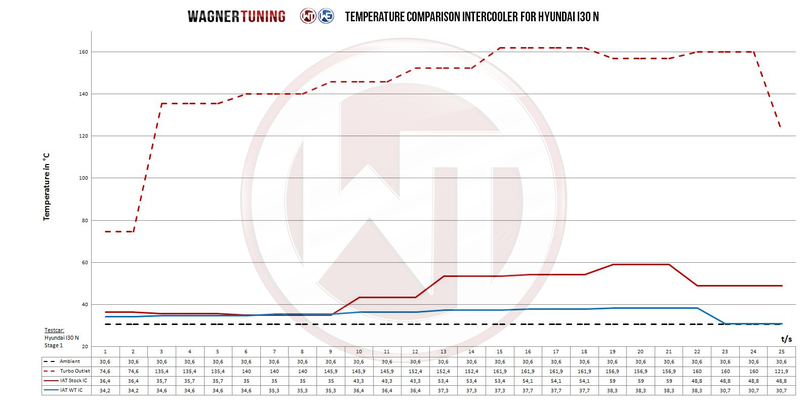 An anti-corrosion powder coating with perfect heat-conducting properties protects the WAGNERTUNING intercooler from all environmental influences, so a lasting and optimal cooling effect can be guaranteed. The installation is done by replacing the original intercooler and is easy to perform (plug and play). All our products are subject to a continuous quality monitoring.